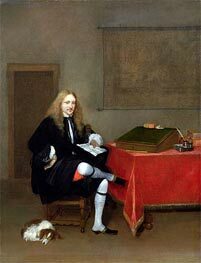 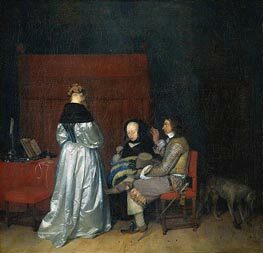 Gerard ter Borch (or Terburg) (1617-1681), Dutch subject painter, was born at Zwolle, in the province of Overijssel, the Netherlands. 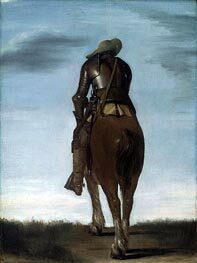 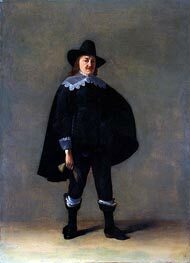 In 1635 he was in London, and subsequently he travelled in Germany, France, Spain and Italy. 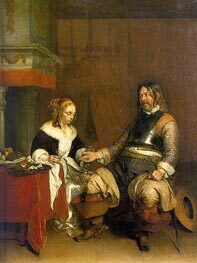 It is certain that he was in Rome in 1641, when he painted the small portraits on copper of Jan Six and A Young Lady (Six Collection, Amsterdam). 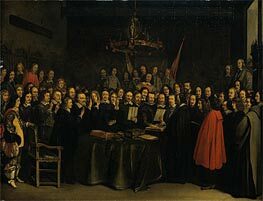 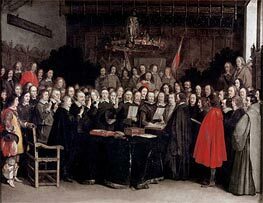 In 1648 he was at Munster during the meeting of the congress which ratified the treaty of peace between the Spaniards and the Dutch, and executed his celebrated little picture, painted upon copper, of the assembled plenipotentiaries a work which, along with the Guitar Lesson and a portrait of a Man Standing, now represents the master in the national collection in London. 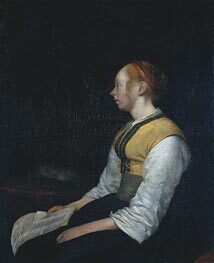 The picture was bought by the marquess of Hertford at the Demidoff sale for 1280, and presented to the National Gallery by Sir Richard Wallace, at the suggestion of his secretary, Sir John Murray Scott. 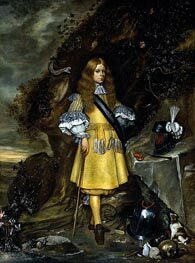 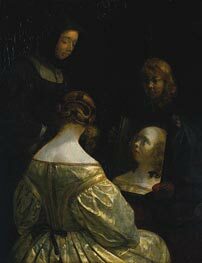 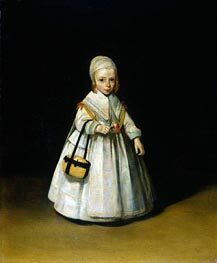 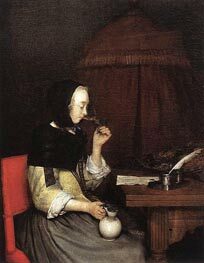 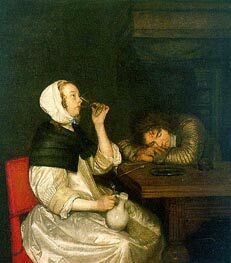 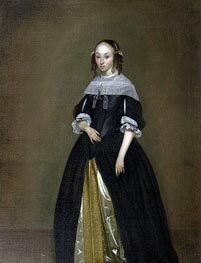 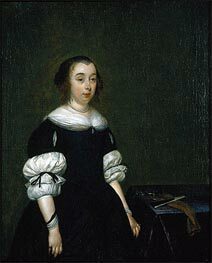 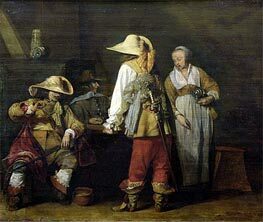 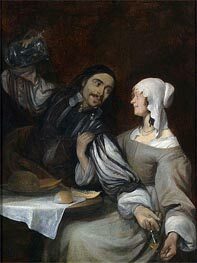 Ter Borch is excellent as a portrait painter, but still greater as a painter of genre subjects. 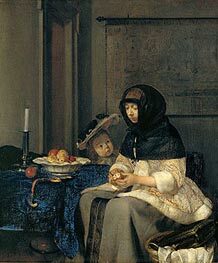 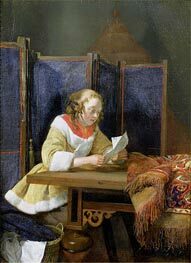 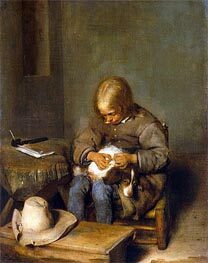 He depicts with admirable truth the life of the wealthy and cultured classes of his time, and his work is free from any touch of the grossness which finds so large a place in Dutch art. 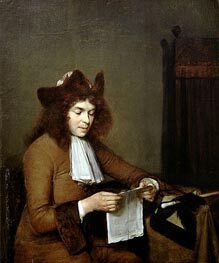 His figures are well drawn and expressive in attitude; his colouring is clear and rich, but his best skill lies in his unequalled rendering of texture in draperies, which is seen to advantage in such pictures as The Letter and in The Paternal Advice (known as The Satin Gown) engraved by Wille which exists in various repetitions at Berlin and Amsterdam, and in the Bridgewater Gallery. 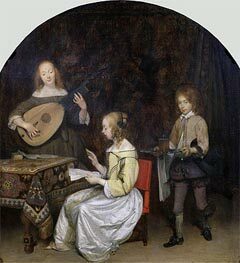 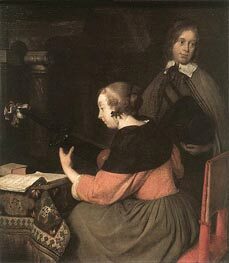 Ter Borch's works are comparatively rare; only about eighty have been catalogued. 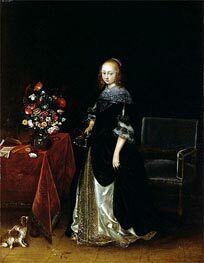 Six of these are at the Hermitage, six at the Berlin Museum, five at the Louvre; four at the Dresden Museum, and two at the Wallace Collection.